Leo Viktor Frobenius (June 29, 1873 – August 9, 1938) was a German ethnologist and archaeologist, one of the leading experts on prehistoric art. He was also one of the initiators of the culture-historical approach to ethnology. Frobenius introduced the term Kulturkreis (culture circle) to describe the area of influence of a particular culture over other cultures. This idea was based on the concept of cultural diffusion as the method by which elements of a culture, both material things and in the form of ideas and customs, spread from their point of origin to more distant human societies. Frobenius believed that cultures grow and decline, much as all organic life does, noting three phases in the life of a culture. He also recognized that African culture was as significant in human history as that of other continents, a view not commonly held in his time. Thus, Frobenius contributed to our understanding of the connections among different human societies, bringing us closer to one human family. 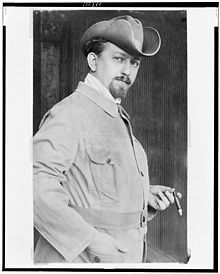 Leo Frobenius was born on June 29, 1873, in Berlin, Germany, the son of a Prussian officer. As a child, he showed enthusiasm toward the collecting of African artifacts. By young adulthood, he had assembled a significant collection of written and pictorial material of particular ethnological motifs. This collection later became part of his wider assembly of African art, many pieces of which are today in Frobenius Institute in the University of Frankfurt. Frobenius never completed high school, or received any form of formal education. This was due to the fact that his father, an army officer, had to move around and always took his family with him. Frobenius never had a chance to complete school. He was mostly self-taught, studying the works of Heinrich Schurtz (whom Frobenius considered his teacher), Friedrich Ratzel, and Richard Andree. He was particularly fascinated by the work of Heinrich Schliemann. In the period between 1904 and 1935, Frobenius led 12 expeditions to Africa. His first expedition in 1904 was to the Kasai district in Congo. There he studied the rock paintings and other art of local tribes. The results of his research were published in his Und Afrika sprach, 3 vols. (1912/13; translated in 1913 as The Voice of Africa, 2 vols.). Until 1918, he traveled to the western and central Sudan, and in northern and northeastern Africa. Between 1921 and 1928, he published a 12-volume series of folk tales and poems under the title Atlantis, which served as an excellent source of material for historians of religion. He also visited Morocco, Algeria, Libya, Egypt, and South Africa. He later traveled to explore centers of prehistoric art in the Alps, Norway, and Spain. His last expedition in 1938 was to Australia, where he studied Aboriginal art. His book Kulturgeschichte Afrikas (1933) summarized his research. In 1920, he founded the Institute for Cultural Morphology in Munich, where he exhibited his entire collection. In 1925, the institute was moved to Frankfurt. The University of Frankfurt in 1932 granted Frobenius an honorary lectureship in the department of ethnology and cultural studies. In 1934, he was appointed director of the Municipal Ethnological Museum in Frankfurt. In 1938, he established a periodical Paideuma, devoted to the problem of cultural morphology. Frobenius died in his residence in Biganzolo, Lago Maggiore, Italy, shortly after he turned 65. Drawing upon the work of Friedrich Ratzel, in his work from 1898 Der Ursprung der afrikanischen Kulturen (The origin of African culture), Frobenius introduced his definition of the term Kulturkreise (“culture circle”). Generally, Kulturkreise referred to a larger sphere of cultural influence that develops from a center of origin toward the periphery, and has impact on other cultures in its area of influence. However, unlike other German ethnologists who traced particular elements of a culture and tried to find their origin in a particular Kulturkreise, Frobenius believed that all cultural elements need to be viewed in the more complex context of their culture as a totality. In another words, he argued that elements of culture should be studied as part of the organic whole of which they are parts. Only then one can understand the complex, historical nature of a particular culture. He also supported the notion of "cultural diffusion,"—the spread of ideas and material culture through conquest or trade. Anwendung (lit. "utilization") – a culture’s old age. Cultures, argued Frobenius, have laws of their own, independently of the people who live in them. Those laws, just like biological laws of nature, guide them through their life cycles. He used the Greek word paideuma to describe that internal law. His entire book, Paideuma: Umrisse einer Kultur- und Seelenlehre (Outline of a theory of culture and spirit; 1921) was on this topic. This concept of culture as a living organism was influenced by the theories of Oswald Spengler. Frobenius was especially inspired by African cultures, and regarded them to be as genuine as the cultures of other continents. This view was rather novel, in a time when others thought of Africa as “without history.” He tried to bring African history out of the darkness, putting it into a historical relationship with other cultures. Frobenius’ writing with Douglas Fox, African Genesis: Folk Tales and Myths of Africa, was a channel through which some African traditional storytelling and epics entered European literature. In 1911, Frobenius claimed that he had found proof of the existence of the lost continent of Atlantis. This was based on some sculptures which he discovered in the area of Ile-Ife in south-western Nigeria. The statues were made in bronze and terra cotta, and were so naturalistic that Frobenius concluded that they could not have been made by Africans, but rather by some unknown civilization. He believed that a great civilization existed in the heart of Africa, and that it gradually disappeared. He saw evidence for his claims in local vegetation, architecture, and even local myths and fairytales. Later, archeologists, however, attributed the artifacts found by Frobenius as belonging to the Yoruba culture. Due to his studies in African history, Frobenius is a figure of renown in many African countries even today. In particular, he influenced Léopold Sédar Senghor, one of the founders of Négritude and first president of Senegal, who once claimed that Frobenius had "given Africa back its dignity and identity." Aimé Césaire, a Martinican poet, also quoted Frobenius as praising African people as being "civilized to the marrow of their bones," as opposed to the degrading vision encouraged by colonial propaganda. Frobenius’ concept of Kulturkreise was further extended and developed by Fritz Graebner. In 1925, the city of Frankfurt acquired his collection of about 4,700 prehistorical African stone paintings, currently at the University's institute of ethnology, which was named the Frobenius Institute in his honor in 1946. Frobenius, Leo. 1898. Der westafrikanische Kulturkreis. Gotha: Justus Perthes. Frobenius, Leo. 1898. Der Ursprung der afrikanischen Kulturen. Berlin: Gebrüder Borntraeger. Frobenius, Leo. 1903. Weltgeschichte des Krieges. Hannover: Gebrüder Jänecke. Frobenius, Leo. 1921. Paideuma: Umrisse einer Kultur- und Seelenlehre . München: Beck. Frobenius, Leo. 1921-1928. Atlantis; Volksmärchen und Volksdichtungen Afrikas (12 Vols.). Jena: E. Diederichs. Frobenius, Leo. 1923. Dokumente zur Kulturphysiognomik. Vom Kulturreich des Festlandes. Berlin: Volksverband der bücherfreunde. Frobenius, Leo. 1931. Erythräa. Länder und Zeiten des heiligen Königsmords. Berlin: Atlantis-Verlag. Frobenius, Leo. 1933. Kulturgeschichte Afrikas. Erschienen im Phaidon Verlag. Frobenius, Leo. 1950. Das Urbild: Cicerone zur vorgeschichtlichen Reichsbildergalerie. Frankfurt: Forschungsinstitut fur Kulturmorphologie. Frobenius, Leo & Ulf Diederichs. 1980. Schwarze Sonne Afrika: Mythen, Marchen und Magie. Düsseldorf: E. Diederichs. Biography of Leo Frobenius. BookRags.com. Retrieved on December 19, 2006. Leo Frobenius (1873-1938). Encyclopedia Britannica. Retrieved on December 19, 2006. The Frobenius Institute - Germany's oldest anthropological research institution. Leo Frobenius (1873-1938). – Biography on Literary Encyclopedia website. This page was last modified on 25 June 2018, at 21:45.